A 21yo Laddie matured exclusively in Oloroso Sherry Casks , heaven or hell ? A lot of people didn’t like this , i did ! Released at 46% abv , it is a very deep amber going on Mahogany in colour , a lot of people said the dreaded “S” word when trying this one , now i’m usually very receptive to “S” but all i get on this is really heavy sherry , it’s really fruity on the nose , quite closed at first but when it does open up , a very relaxed Christmas Cake , dried fruits , spices and dark chocolate . The palate isn’t over powering , very dry oloroso , very Christmas Cake (dried fruits etc) , just a wee hint of some green fruits and orange . The finish is surprisingly short at first , Then it gets longer with time , very warming , Apricot Marmalade and Marzipan , also Orange . Very oily in the glass , takes a wee while to open up but when it does it’s a cracker , not a sign of anything sulphury , extremely well balanced , a good , sherried Laddie . 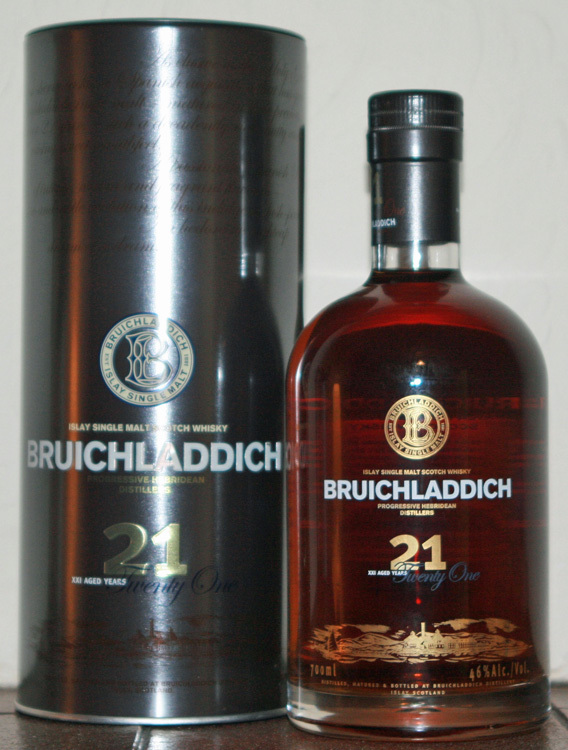 This entry was posted in Islay Whisky Classics and tagged Bruichladdich, Bruichladdich 21, Bruichladdich Distillery, Bruichladdich Single Malt Whisky, Islay, Islay Single Malt Whisky, Islay Visits, Islay whisky, Isle of Islay by Gordon_H. Bookmark the permalink.